Growing up in Vermont, we know a few things: maple syrup, cheese, cows and Ben and Jerry’s ice cream. All of these things I love, well except the cows, they kinda smell, especially in the summer time. Every year, Ben and Jerry’s hosts Free Cone Day, which is a national holiday in my opinion. There was a Ben and Jerry’s café down the street from my elementary school, so on free cone day (if you had a good teacher) your class took an afternoon field trip to get a free ice cream cone. Then, after school, you and your friends waited in the longest line ever for your second free ice cream cone. And then maybe you repeated that a few times. I remember one year, this kid had every flavor on the menu, no joke, there was something like 50 flavors on the menu. What was awesome about free cone day was trying new flavors that you might be out of your comfort zone. For me, that was Chunky Monkey. Chunky Monkey is a banana ice cream with chocolate fudge and walnuts mixed in. I had about a dozen “favorite” flavors of their Ice Cream. Once I tried the Chunky Monkey, it was added to my list. Today, the Chunky Monkey ice cream was the inspiration behind these bars. 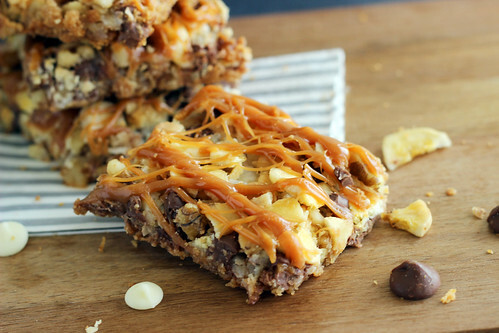 You really can’t go wrong with magic bars. 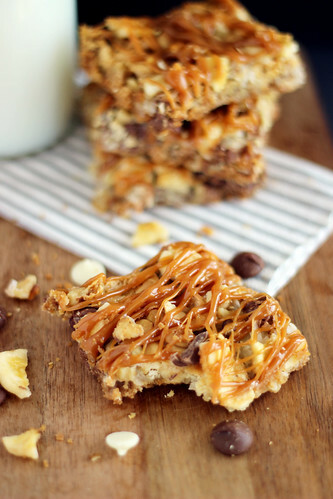 Today, I used your typical magic bar ingredients and finished them off with banana chips and caramel. 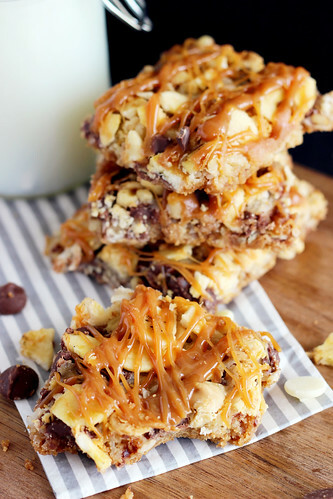 Okay, caramel isn’t your normal Chunky Monkey ingredients, but I feel like you can’t really go wrong with a little (or for this matter, a lot of) caramel. Use a food processor to grind crackers into a fine crumb. 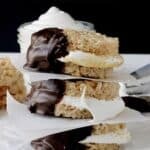 Pour crumbs into a 13×9 inch baking sheet. the bottom of the baking sheet. Be sure to cover the bottom evenly. Next, spread walnuts, shredded coconut and chocolate chips over top of the milk to cover evenly. Pour the remaining half the can over top of the walnuts, coconut and chocolate chips. Bake at 350° for 25-30 minutes until the edges start to turn golden brown. Remove from oven and allow mixture to cool for 5 minutes. In a Ziploc bag, use your hand to gently press and break apart the banana chips. Sprinkle on top of the bars and gently press into the top of the bars. In a microwave safe bowl, pour 5 oz of Kraft caramel bits in the bowl. Microwave according to package instructions; in 20-30 second increments, stirring well after each increment. The caramel will be HOT, so use an oven mitt to remove from microwave. It is possible to microwave and burn the caramel if you microwave for too long, trust me. 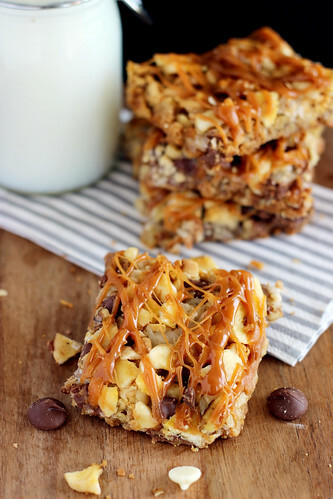 Once the caramel is melted, use a spoon to spread moving your spoon back and forth over the top of the bars. Allow the caramel to cool completely. 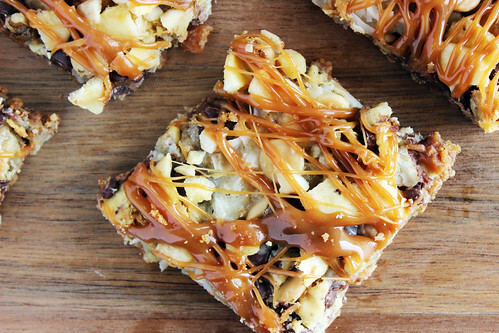 You will want to cut these bars before putting in the fridge, because the caramel will become too hard to cut though. I keep my bars in the fridge in an airtight container. I remove them about 10 minutes before serving to allow the bars to soften slightly. Thank you Ben and Jerry’s for your creative Ice Cream flavors and fun names. I miss our college “pint nights” with Oatmeal Cookie Chunk” but my thighs do not. 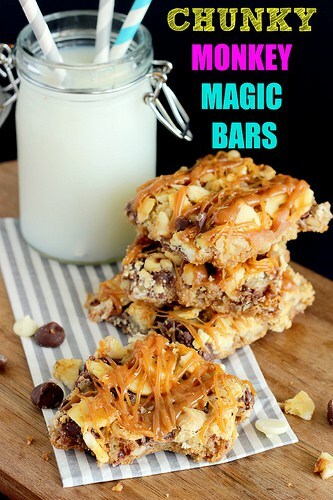 I also saw these amazing CHUBBY HUBBY Magic bars from my Friend Hayley at the Domestic Rebel. Chubby Hubby Ice cream is totally on my top 10 list! Click here to get the nutrition information.